My husband’s birthday is this month and I surprised him by making his favorite cake – a coffee and walnut cake. I first tried a recipe for this time last year and this year, I went back to it. If it’s not broken, why fix it, right? Nigella Lawson’s recipe (from her “Nigella Kitchen” cookbook) proved again to be such a winning, no-nonsense recipe that I vowed to make it my go-to cake (which is exactly what I said last year). My husband adored it. My kids licked their plates clean and begged for more. And really – it is the easiest recipe. The problem, I fear, is that “coffee and walnut cake” still conjures up some mental images of slaving in the kitchen, crushing walnuts with my bear hands, agonizing over brewed espresso, and so forth and so on, that I’m actually immobilized when I think of making it, even when I rationally know it was easy enough to do the last time around. I will let this blog post be a little pep talk to my future self. Self, make this cake again! It tastes amazing and is really shockingly fool-proof! Oh yes, and as a general buttercream frosting phobe, I must add that the espresso-ed up buttercream frosting is ridiculously delicious and would make anyone a believer. Preheat the oven to 350 degrees. Butter the 2 8-inch round cake pans and line the base of each with parchment paper. Add the 2 sticks of butter, flour, 4 teaspoons espresso powder, baking powder, baking soda and eggs and process to a smooth batter. 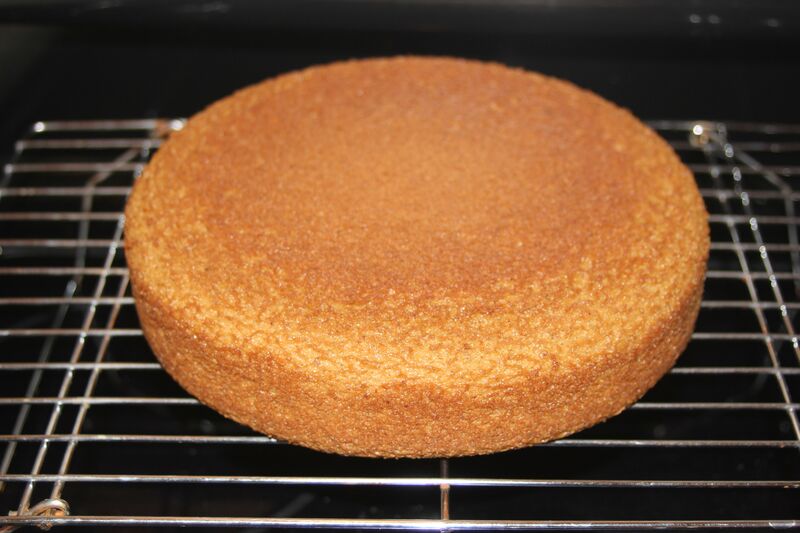 Divide the mixture between the 2 cake pans and bake in the oven for 25 minutes, or until the sponge has risen and feels springy to the touch. Cool the cakes in their tins on a wire rack for about 10 minutes, before turning them out onto the rack and peeling off the parchment paper. Pulse the powdered sugar in the food processor until it is lump free, then add the butter and process to make a smooth icing. Gently press the walnut halves into the top of the icing all around the edge of the circle about 1/2 inch apart. Cuts into 8 generous slices. 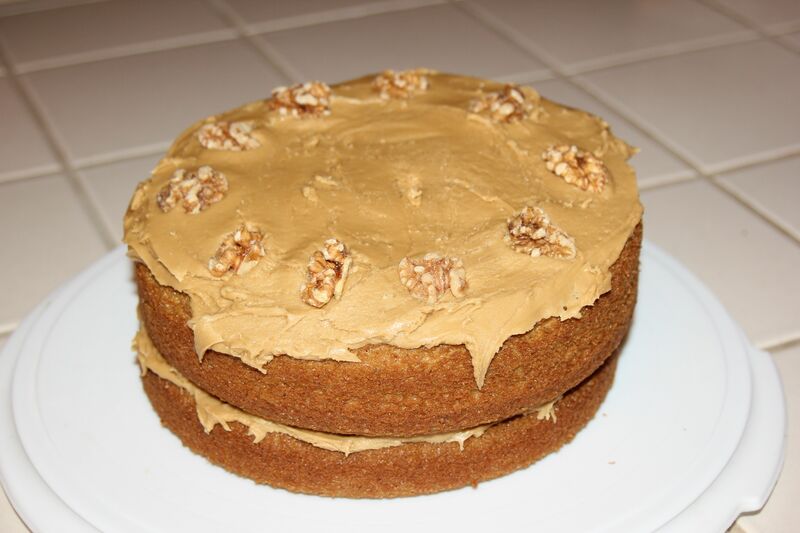 Posted on 18, November 2013, in Food and tagged baking, British, buttercream frosting, coffee and walnut cake, cooking, food, homemade, Nigella Lawson. Bookmark the permalink. Leave a comment.